Are you the kind of person that's always fifteen minutes early? Or maybe you seem to be constantly running ten minutes late. In the military they say that when you're early you're on time, when you're on time you're late, and being late is unacceptable. But in the party crowd, they say you ought to arrive fashionably late. So, whether you're late or early it doesn't matter, in the end, time is a construct made from our civilized ideas. We love the matter for many reasons but mostly because of the way he freed his friends from the curse of the clock. At one point the Mad Hatter, while singing to the Queen of Hearts, murdered time. Murdered time? Well, we say it casually all the time "killing time". Even though it doesn't sound very nice it's quite a pleasant thing to do. We kill time by watching movies, reading books, and whistling while twiddling our thumbs. The pleasant parts of our lives are filled with moments when we're killing time. Maybe that's why we love the Mad Hatter, he stands against the playing card monarchy by getting rid of that imaginary construct that tells us what to do. Revolutionary, if you ask us. If you want to dress as this unforgettable character this Halloween, you'll love this topsy-turvy ensemble. 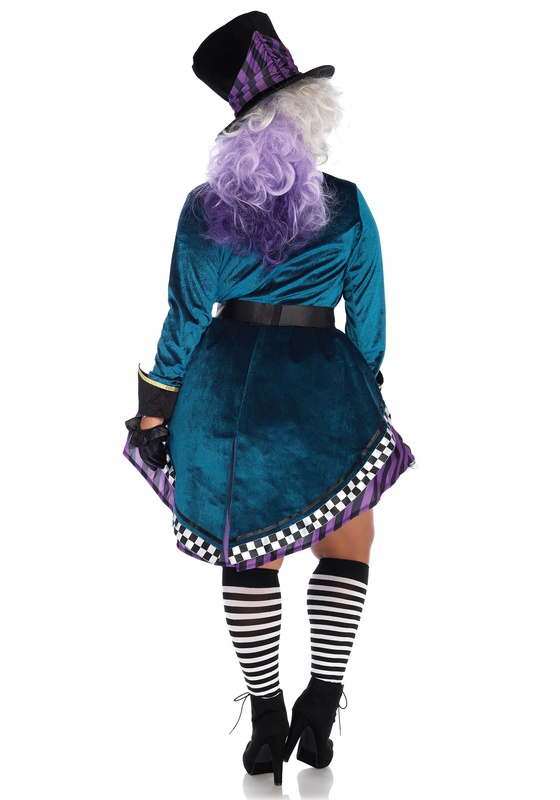 In rich tones of teal and purple, you can be as mad as you want to be. The striped skirt is layered under the sophisticated jacket and matches the fabric on the top hat. The cap is detailed with a clock icon, maybe to warn off those people who might dare say that the Hatter is late.